needs work, they'll say: Rounding Third and Heading for Home. 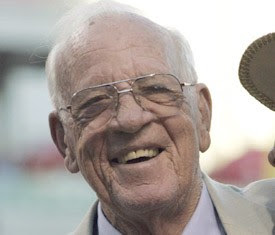 . .
Joe Nuxhall was Cincinnati Reds baseball for over 60 years, beloved by fans and respected by all around baseball. He was constant and sometimes inaccurate. But, through the inaccuracies, Joe represented the Reds and the national pastime as good as anyone before him. Just last year during a series with the Washington Nationals, Nuxhall ran down the "Senator" lineup, before correcting himself. He inaccurately pronounced names, botched calls and showed clear bias for his hometown team. But, his impression on the game was unfathomable. He was a true gentelmen for the sport and perfect example about what is good in our national pastime. He was just plain fun to listen to. He was a reflection of ourselves and the game we love. Methodical and calm. But, enthusiastic if the time was right. He made some of the most significant calls in baseball history, but was over zealous in his accomplishments. Nuxhall saw the rise and fall and rise and fall of the organization he so blatantly loved. He lived and died with the Reds and was always looking toward the next day's game, even in the most drab of situations. Joe was summer to me and I know to my dad and his grandpa. Along with Marty (Brennaman), Joe was the soundtrack to many summer nights growing up. Joe Nuxhall will be missed but he is not really gone, he is the spirit of Hamilton, Cincinnati and especially Reds baseball.